Florence, Siena and Tuscany are by-words of the Renaissance and a rich cultural heritage. 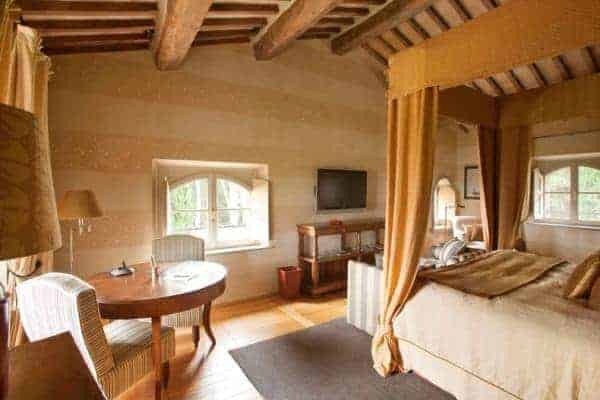 This you can now experience in elegant style, and to a time pre-dating that glorious epoch, when you stay at this luxury villa that is built into walls of former medieval tower and Etruscan stronghold. 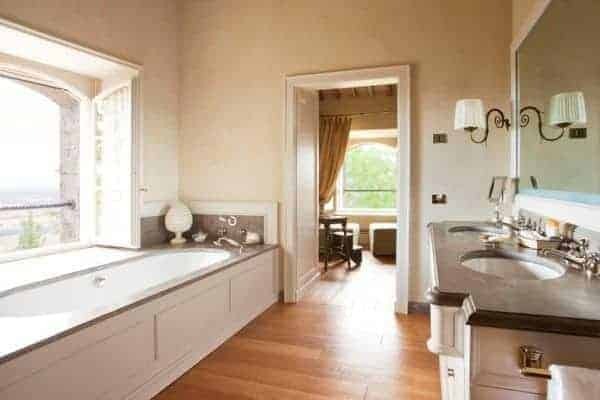 Narrow and high, the villa stands on the end of promontory and offers truly sweeping 180° views of classic Tuscan rolling hills, countryside and the vast estate in which this villa is located. 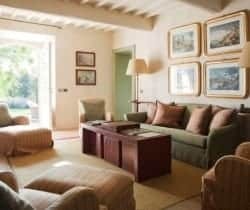 One of 9 newly renovated and refurbished properties on a vast country estate dating back 800 years within the Val D’Orcia Natural Park, the luxury villa is close to the estate’s centre, “Il Borgo”. However, the villa is totally private, independent and secured by gated private access. The fine refurbishment retains gorgeous Tuscan fireplaces. 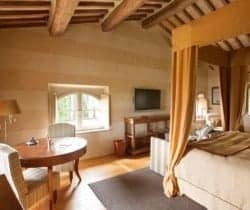 Due to the building’s age, rooms recall the original intimacy of castle life and for you to cocoon yourself in luxury and peaceful bliss. Outside a desirable panoramic pool and large garden opens up the world for your admirable delight and enjoyment. 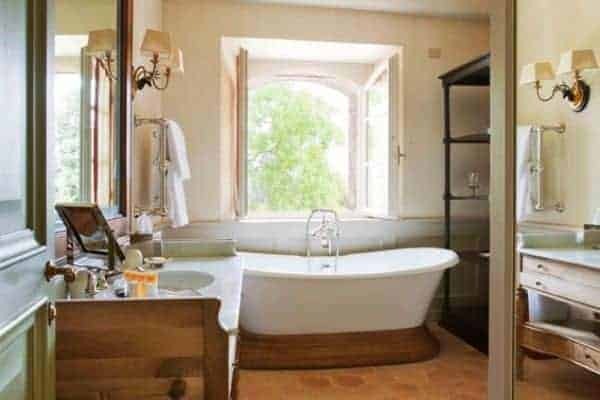 You can go higher up to overlook all from a wooded and naturally shaded terrace that will thrill you with outstanding views of the timeless Tuscan landscape of vineyards, orchards and rolling hills. You will even see – and possibly get to play through separate concierge arrangement – the nearby and superb championship private golf course specially designed by one of the sport’s legends, Tom Weiskopf. 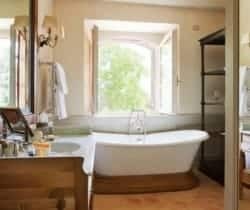 Over 3 floors this lovely villa sleeps 6 guests in 3 en suite bedrooms. The master suite on the top level is set over the entire floor with a majestically large bathroom accessible on either side, while the double bedroom on the first floor has an original Tuscan fireplace that has built-in side seating for you to enjoy toastier times during colder nights! As you enter the villa you are directly into the living room, which leads to the dining room and kitchen, and the staircase leading up to the bedrooms on 2 floors above. The outside spaces are as atmospheric, also large and give total privacy, including the stone- terraced swimming pool surrounded by mature garden and hillside vegetation. Later on in the day and evening, you will want to relax even further, entertain friends or leisurely dine on the upper terrace, where you will be serenaded by the evening summer breeze rustling the leaves of the surrounding trees. 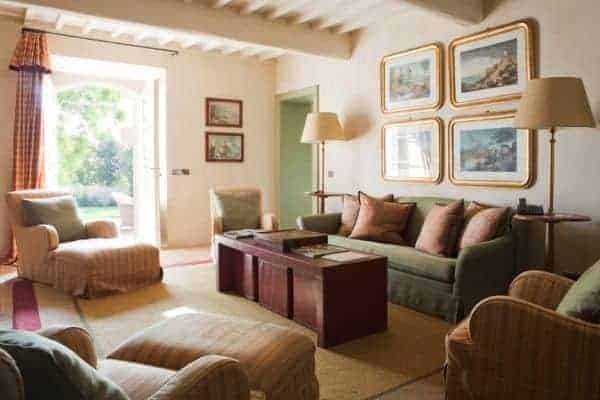 This luxury villa is conveniently located and within walking distance of the central Borgo, yet remains peacefully secluded and is topped off by its bird’s eye view over the vast estate and other villas in the distance. 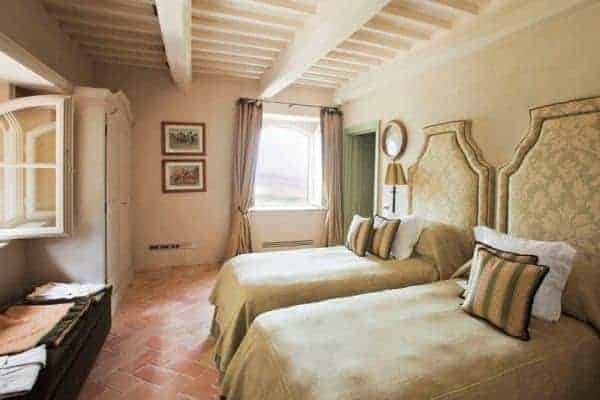 This property is a perfect hideaway for a family or small group of friends wanting to experience a truly grand and stylishly memorable holiday in the heart of Tuscany. You will live part of the region’s heritage while also being able to enjoy more modern and superb amenities of Il Borgo. 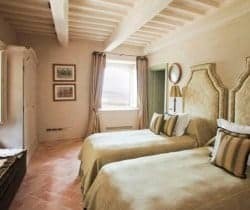 These include a 5-star spa and gym, a panorama bar, restaurants and a winery, where you can indulge in wine tasting and sampling the estate’s iconic and prestigious red wine, Brunello di Montalcino.